(a) Proximal row includes talus and calcaneus. (b) Middle row is made of navicular. (c) Distal row is composed of 3 cuneiforms (medial, intermediate, and lateral) and cuboid. Cuneiforms are small wedge shaped bones and ordered from side to side in front of navicular. All these are 5 tiny long bones. 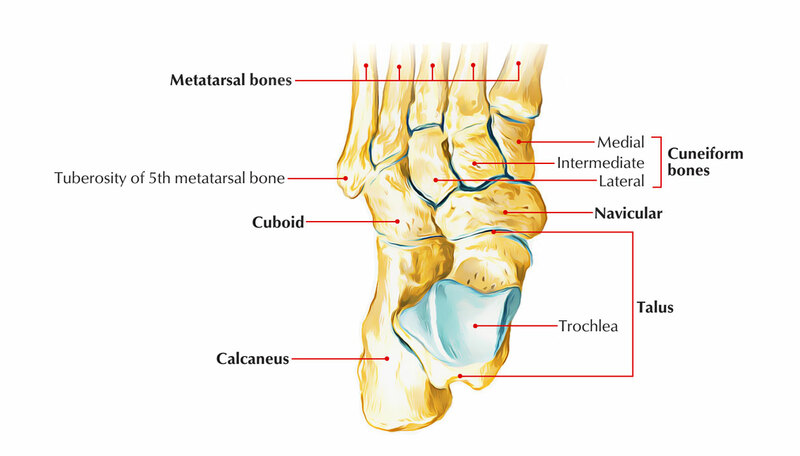 The 5 metatarsal bones collectively make up the metatarsus. They can be numbered from medial to lateral sides as first, second, third, fourth, and fifth. The lateral side of its base projects proximally and somewhat laterally to create a large tuberosity (styloid process). The phalangeal bones are tiny long bones. They’re 14 in number in every foot- 2 for the great toe and 3 for every of the other 4 toes. The phalanges in the great toe are proximal and distal, and phalanges in other toes are proximal, middle, and distal. 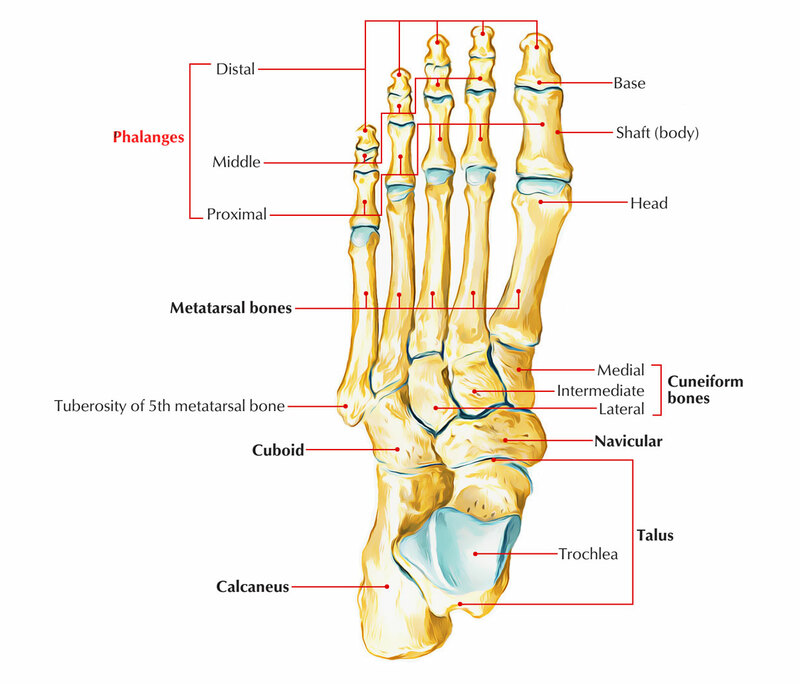 The base of the proximal phalanx presents a concave facet which joint together with the head of metatarsal bone to create the metacarpophalangeal joint. The distal end of the proximal phalanx presents a pulley like articular surface and articulates with the middlephalanx in the lateral 4 toes and with terminal phalanx of first toe. So, lateral 4 toes possess 2 interphalangeal (IP) joints, proximal and distal, and the great toe possesses only 1 IP joint. Both, proximal and distal articular surfaces of the middle phalanx are pulley-shaped. The distal phalanx of every toe bears a rough tuberosity on plantar aspect of its distal end. Every phalanx ossifies from 2 centers: a primary center for the shaft and a secondary center for the base. (a) For proximal phalanges: 12th week of IUL (Intrauterine Life). (b) For middle phalanges: 15th week of IUL. (c) For distal phalanges: 9th week of IUL. (a) For proximal phalanges: 2 years. (b) For middle phalanges: 4 years. (c) For distal phalanges: 8 years. The fusion of epiphysis (base) with diaphysis (shaft) takes place in about the 18th year.